Miwa Yanagi, internationally renowned photographer and video artist, is currently directing the “Railroad Art Festival Vol.2 – Theater of Station” in Osaka. It is a unique annual art festival focusing on “railroad and its culture”. Reflecting recent Yanagi’s growing interests in theater, this year’s program is getting to be highly performance-based. Guest artists to the festival are musicians, stage directors, performers and also a professor who develops performing humanoid robots. 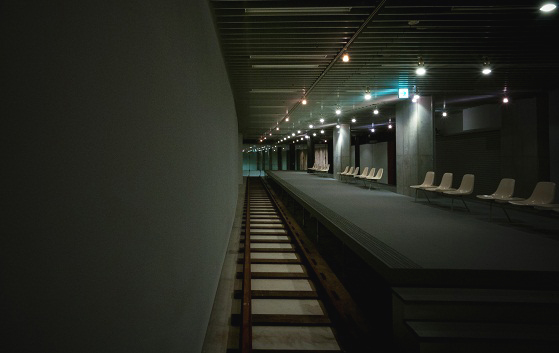 At the start of the festival, Yanagi created the stage perfectly looks like the subway station platform. They have been providing series of performance events on this stage since its opening in October. See and compare it with our report for the last festival which was led by German-based artist Tatzu Nishi in the same venue. Now it is a totally different place. Miwa Yanagi is of course best known for her photograph series, “Elevator Girls”, “My Grandmothers” and “Fairy tale”. However, she has created short theatrical artworks in 2010 and started full-fledged theater production since 2011. Now she doesn’t hesitate to introduce herself as a “less-experienced theater director” (in her twitter profile). Nonetheless, I can’t say that her career as director is so little. In fact, “Elevator Girls” first started as a performance piece. She always showed the same tension as stage performance in her creation. And the stories are the lifeblood of her works. Among many programs held this year, the most remarkable one is “Elevator Girls Project: Osaka edition”. In this three-month-long workshop, Yanagi trains ordinary women to be “Elevator Girls”. Process of workshop is open to the public every time. Finally those Elevator Girls will act in her new play “Panorama – Railroad version-” which is scheduled to be held on the last two days of the festival. According to the artist, a group of Elevator Girls will perform like the Greek chorus using several techniques, including singing, narrating, and acting. Yanagi talking at the premiere of her new video, “Reading ‘Nisshin Senso Ibun(Another Story of the First Chinese-Japanese War)'”. It was held in the building where she was shooting the video. 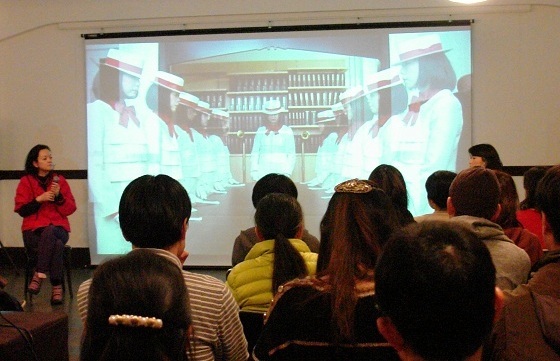 Through this workshop, Yanagi also released her new video work “Reading ‘Nisshin Senso Ibun (Another Story of the First Chinese-Japanese War)'”. This work is created under the Osaka Canvas Project. “Nisshin Senso Ibun” written by Sakutaro Hagiwara is a short story of a soldier, who was once honored for his achievement in the First Chinese-Japanese War, but soon after coming back from the war, descended to begging and died on a park bench. In the video, Elevator Girls are reciting the story sometimes in a monotone voice and sometimes in sober intonation. “Panorama – Railroad version-” is scheduled to be performed on 23rd and 24th December at Art Area B1 inside Keihan Naniwabashi station. I can’t wait to find out how her weird but beautiful imagination takes on a new dimension in a live performance.